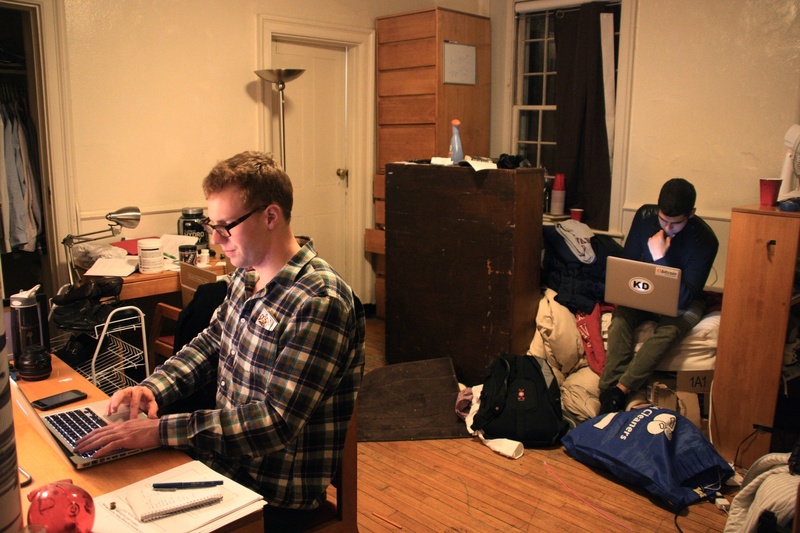 Connie Yan Andrew S. Flesher '15 and Alejandro Perez '15 recreate the founding of Facebook in their n-1 suite. I had the opportunity to meet up with four of the seven residents of Zuckerberg’s Facebook suite for some retrospection, reflection, and laughs. When Mark Zuckerberg launched Facebook from his Kirkland House dorm room in February 2004, he wasn’t much different from any other Harvard student. A decade later, he’s a household name worth billions of dollars. I had the opportunity to meet up with four of the seven charismatic young men who now live in Zuckerberg’s suite for some retrospection, reflection, and laughs. Just like any blocking group of junior boys, the seven of them have ample shared memories and jokes, though they insist the next big thing in technology won’t be coming from their room. “No, I thought some of us knew,” Bergsund counters. Blockmate Jordan N. Mann ’15 recalls being uncertain. “I wasn’t sure if it was a myth, where people thought that’s where it was but no one actually knew,” he adds. Though none of the blockmates have ever met or interacted with Zuckerberg, blockmate Alejandro Perez ’15, a Crimson business editor, has what he calls “literally the smallest connection” to Facebook’s founding. “The co-founder, Eduardo Saverin, went to my high school. I’ve met him,” Perez says. A blockmate adds, “Double coincidence,” and all four boys nod in agreement. However, the room has changed somewhat since the halcyon days of 2004. “The way the room is set up right now is two beds and probably eighteen pieces of furniture. There’s legitimately no space right now. I don’t think it looks anything like it did back then,” Flesher says.